This question popped up in one of my group chats a few months back, and although I am no fashion guru, I knew what was the first thing I needed to find out. Essentially, I was telling her to look her best, pander to their male egos and flirt a little—all to get what she wanted. Over one hundred years later, these words still hold true. Feminists may rise up in arms against my thoughts and my title, but I think any girl or woman in business who needs to network should consider the following. Before I continue, let me clarify that I am not advocating seducing anyone for malicious gains. Flirting is a tool and tools are meant to be used. When it comes to meeting new people and getting the important contacts you need to advance your career and business, as long as it’s not legally and morally wrong, and if you have no qualms, use it. This is also not a guide on how to flirt, but on why people, particularly women, should flirt for networking purposes. The piece that sparked this article was actually a writeup on how a girl in business school deliberately used a dating app to meet incredibly wealthy men. She would find the matches, meet up with them and proceed to talk about business, while flirting a little. It worked. She got herself corporate mentors, contacts and some even helped her to secure internships. Reading it, I cheered her on for that idea, wondered about if it was replicable and was sure she would get a lot of flak for it. I went to the Facebook comments section, bracing myself for the hatred and random bursts of anger such topics usually produce. However, what I found instead was much more positive. Many comments were either supportive or cautiously approving, or very neutral. Perhaps the moderators had already curated them and removed the profane, but most people seemed alright with it. Though there were some that pointed out that the practice was more detrimental than beneficial, in general, no one seemed to take very much offense against it. I took it as an indication that the general public was ready for this idea, or at least, was open to discussing it. The glass ceiling and how men generally have an advantage in business and in the corporate world has been written about countless times and proven again and again. It should come as no surprise that men even have the upper hand when it comes to networking and forming contacts. Flirting is a way for women to even the playing field. In a world where men tend to only form professional networks with other men—thus keeping the contacts and advantages within one gender—flirting is one of the ways that allow women to break into the sausage fest and get into places where they are noticed and can show off their true abilities. Google tells me that to flirt is to “behave as though attracted to or trying to attract someone, but for amusement rather than with serious intentions”. Networking on the other hand is “to interact with other people to exchange information and develop contacts, especially to further one’s career”. Both involve human interactions and both require making others like you, or at least form a good impression of you. 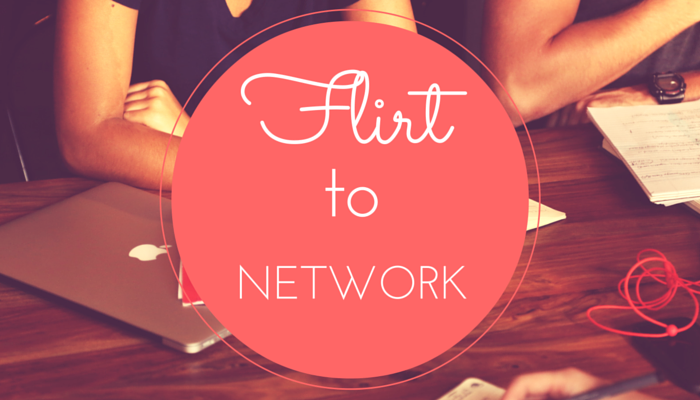 Good flirting and good networking share these traits: making eye contact, smiling, showing interest by asking questions and listening. According to Nicole Williams, the founder and CEO of WORKS—a company dedicated to helping young women create and advance their careers—flirting is part of an effort to make someone feel confident and attractive. If you were being pedantic and saying that you “purely want to network”, making someone feel good about themselves is one of the easiest ways to get others to like you and think highly of you, even in a purely platonic sense. Let’s put it this way. Flirting is fun. Networking on the other hand can be a tiresome chore. It’s necessary, but not something everyone can enjoy. As explained earlier, since flirting and networking employ mostly the same tactics and skills, by changing our perception of it, we can make it more interesting and enjoyable. Just changing our idea to something being fun starts a self-fulfilling prophecy that it is fun, and you like what you’re doing. And we know time flies when we’re having fun, so rather than see yourself being trapped in a stuffy networking situation, see it as an opportunity to flirt a little, have some fun, and get the business contacts you need. It may surprise you to find that I consider myself a feminist. I don’t particularly care about equality, but I am very passionate about equal opportunity. In my ideal world, women (and men) wouldn’t resort to such tactics because they wouldn’t need to, but that is not the case now. Also, I definitely don’t believe in using charm and flirting to get what you want when you don’t deserve it or don’t have the ability to handle the responsibilities that come your way. You should also always be careful to watch the reactions of the people around you to ensure that your flirting is not taken the wrong way or misread as an intention or signal for something more intimate. Would I actually try flirting to network? Probably not, but that’s more of my personality issue rather than a distaste for the method. Talking to strangers is already painful enough, flirting is a skill I will have to work very hard to master. Do you disagree with what I’ve written? Let’s go out for coffee and discuss it.